Another day, another sheet pan! 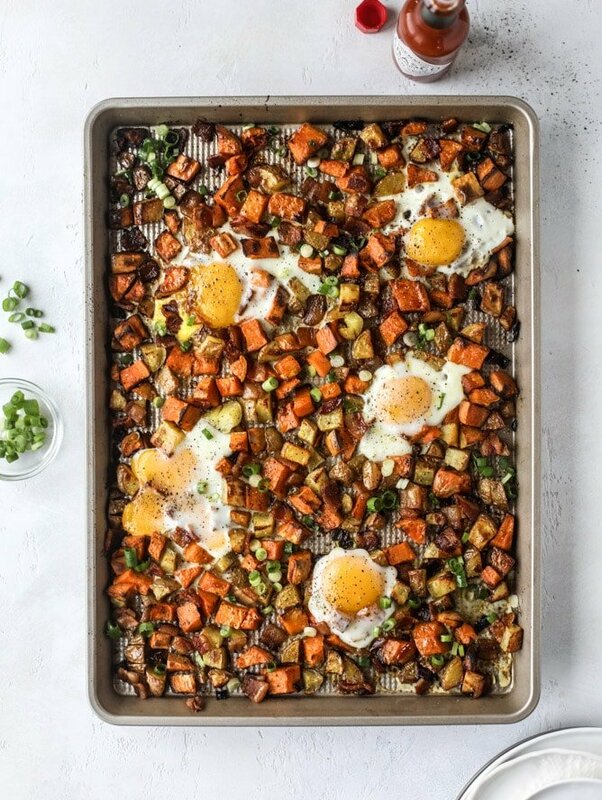 But this time… sheet pan BREAKFAST! Because everything tastes better with an egg on top. I was inspired to make another sheet pan meal like this after my friend Juli at paleomg made something similar. It’s not a new combo for us, but I never ever considered making it on a sheet pan. I knew we’d LOVE something like this for breakfast, but actually – more for dinner! We tend to do breakfast for dinner every other week or so. It’s a great fall back when we don’t know what to eat, but it’s also something we adore, so we don’t think of it as a cop out dinner. And this! We are OBSESSED with. And! I can’t believe I’m sharing another sheet pan meal with you either! Seriously. A few weeks ago I made three of them that are staples in our house. They are basically the only sheet pan meals that we love and make over and over again. So there is one more to come! Ooooh. Back in 2015, about four months after I had Max, I did whole 30 and a version of this was one of my go-to breakfasts. 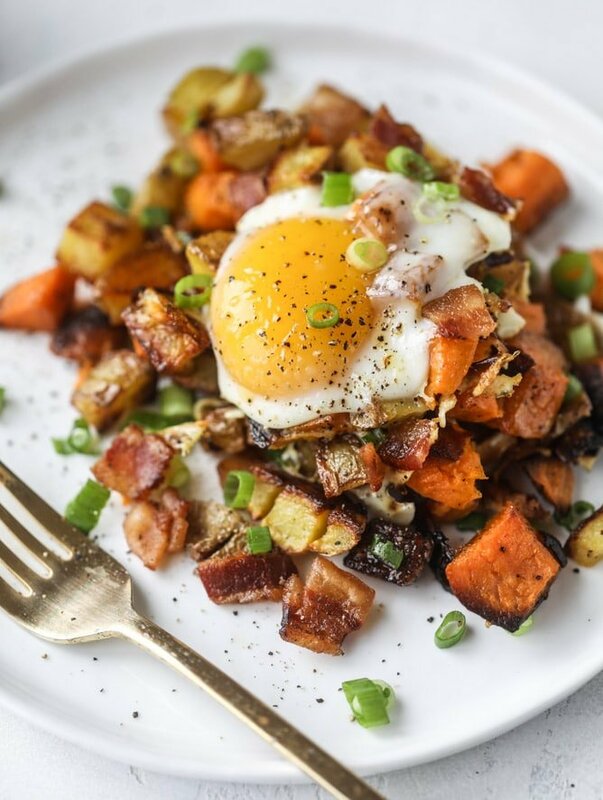 I loved it so much (just not after eating it everyday straight for two weeks, ugh) and would make it in a skillet – the potatoes, bacon, eggs on top – everything. Or I’d even scramble eggs right into it. Eating sweet potatoes like this is exactly how I want them. I’m never going to be the person who slices open a baked sweet potato for dinner and eats it plain as a side to chicken or fish. I think that is super boring and not flavorful. But this I can do. And adore. One other thing? I am obsessed with adding brussels sprouts to this too! Oh it’s freaking ridic. And if you’re weirded out by cracking the egg over top, or just have a bunch of people who want their eggs cooked differently, you can always still do that part in a skillet and make the base on the sheet pan. I pretty much can’t stop eating this directly off the pan. It’s so good. Crispy potato bottoms and bacon are my love language. ALSO! The Pretty Dish is out TOMORROW! Be sure to grab your copy here so you can get that free bonus cookbook! Place the potatoes, onions and garlic on a baking sheet. Drizzle on the olive oil, salt and pepper and toss well. Add in the bacon - scatter the pieces all over the sheet. Roast for 25 to 30 minutes, tossing once during cook time. You want the bacon to be crisp and the potatoes to be golden and softening. Cook a little longer if needed! Once the bacon is crisp and potatoes are cooked, add the eggs directing on top of the sheet. Stick the pan back in the oven and bake anywhere rom 5 to 12 minutes - depending on how cooked you'd like your yolks! Remove the pan from the oven and serve the potatoes and eggs immediately. Top with sliced green onions and hot sauce! Love this recipe! I love runny egg yolks and will definitely add brussel sprouts! I love this idea so much!! I love making hash but I hate cleaning out my skillet afterwards so this is making me very happy! This looks awesome for meal prep too! I could easily make everything but the eggs and quickly cook eggs for a delicious breakfast :) Can’t wait for your book tomorrow!!!!!! Love this! 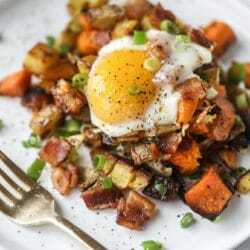 I make sweet potato hash all the tine in a skillet usually with chicken sausage. This saves some pans and makes it even easier! And eeepp! So excited to get my book tomorrow! Just received an email from Amazon that my copy of The Pretty Dish is arriving tomorrow! Woot woot. My copy shipped today! I can’t wait. I love your blog, Jessica! Love this recipe!! Thanks for sharing :) I bet it would be good using leftover corned beef in lieu of the bacon, too! Just making this now for dinner instead of breakfast. Thanks for the idea!! This is a new favorite for my family of 5! I made it originally for brunch, but I will definitely have it for breakfast dinner too. I tried the eggs and cannot believe how good it was!! Ummm….seriously. Where did you get those forks from? And yes, sheet pan meals and potatoes any day. Thanks for sharing this amazing recipe, I made it yesterday and I fell in love hard!